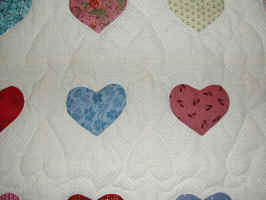 I received this quilt as a pieced top, and I quilted it with hearts and did the binding work. 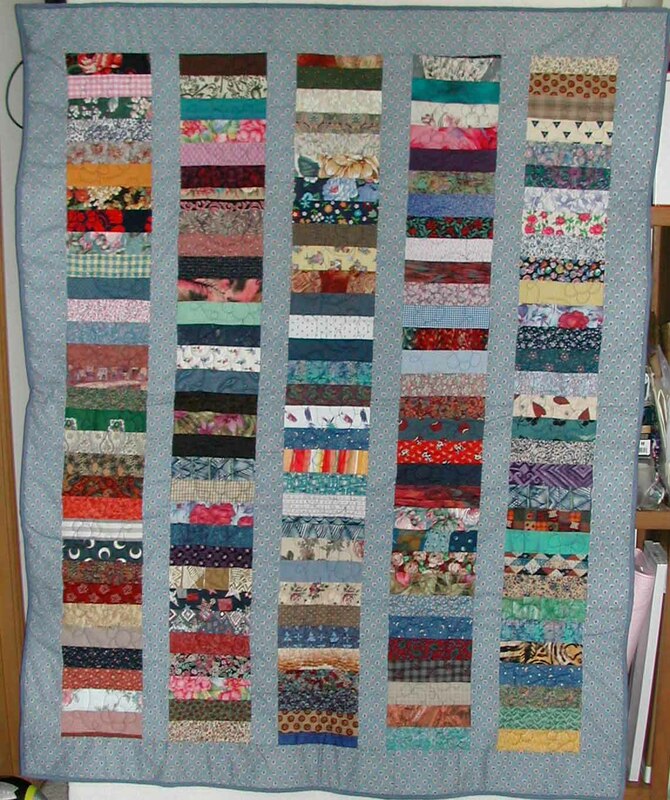 It was a labor of love from all the women in the OHGWQ Yahoo group. 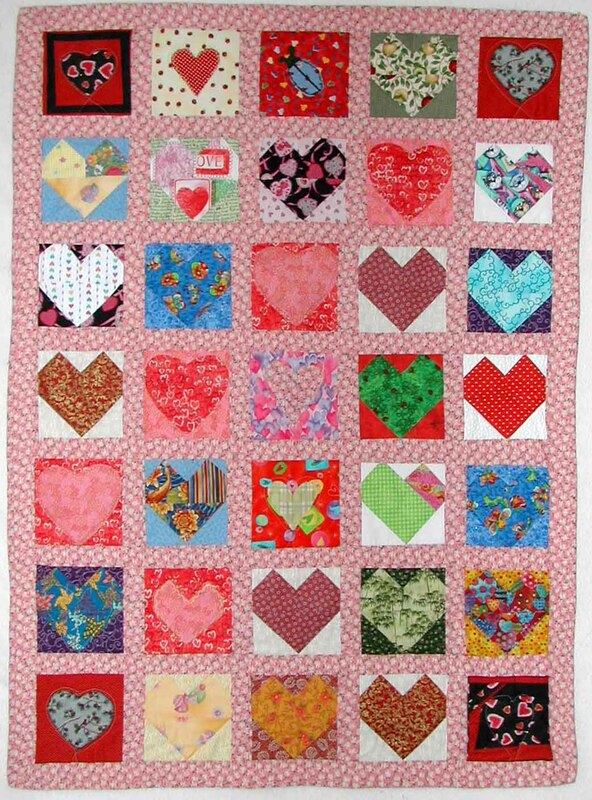 Thanks to all those women with helping hands who created blocks, and pieced it! 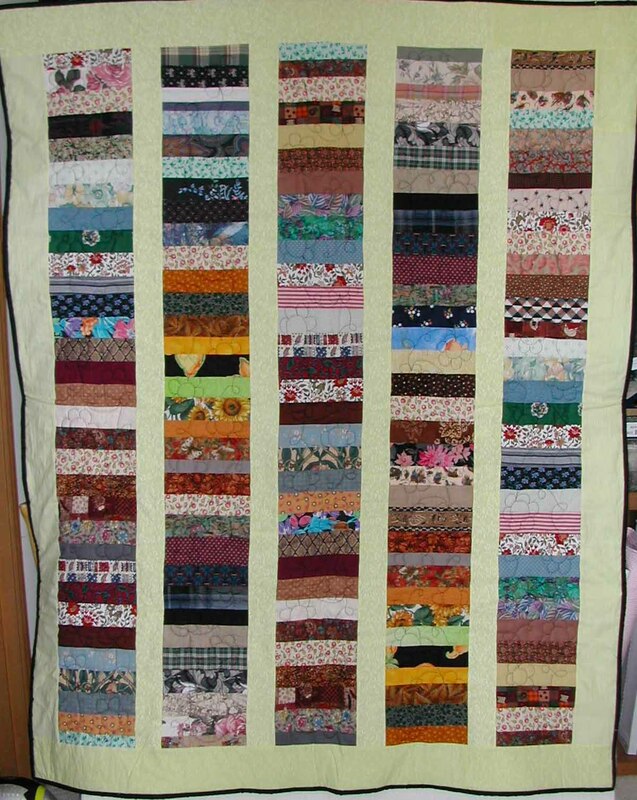 This quilt was a labor of love from our Yahoo 100 Good Wishes Quilt Group. We had a bug fabric exchange where we all exchanged fabrics with bugs on them. 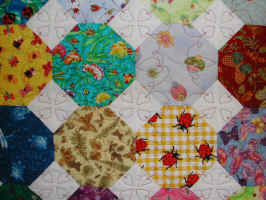 Chris Schulte collected the bug blocks for this quilt and pieced the top. 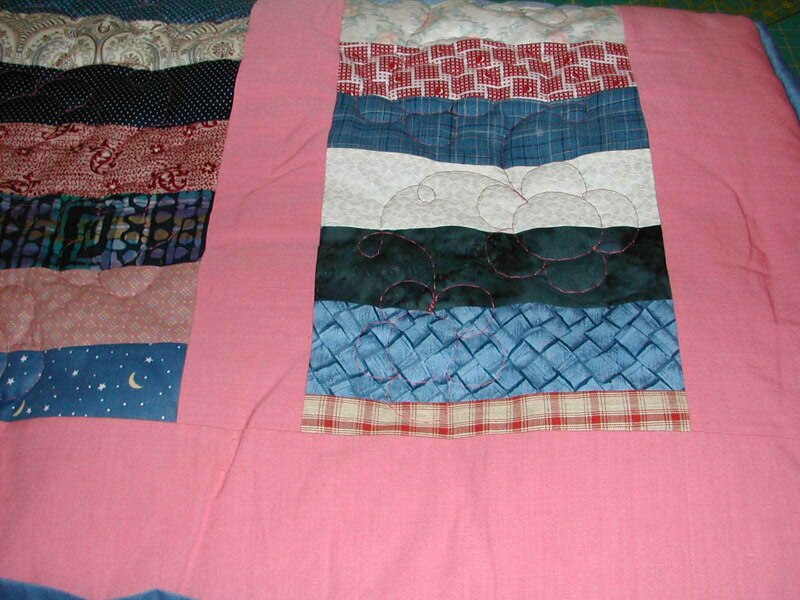 She sent it to me, and I added a border, quilted, and finished the binding work. We will now ship this to Half the Sky www.halfthesky.org, and they will either auction this off, or take it to one of the orphanages in China. 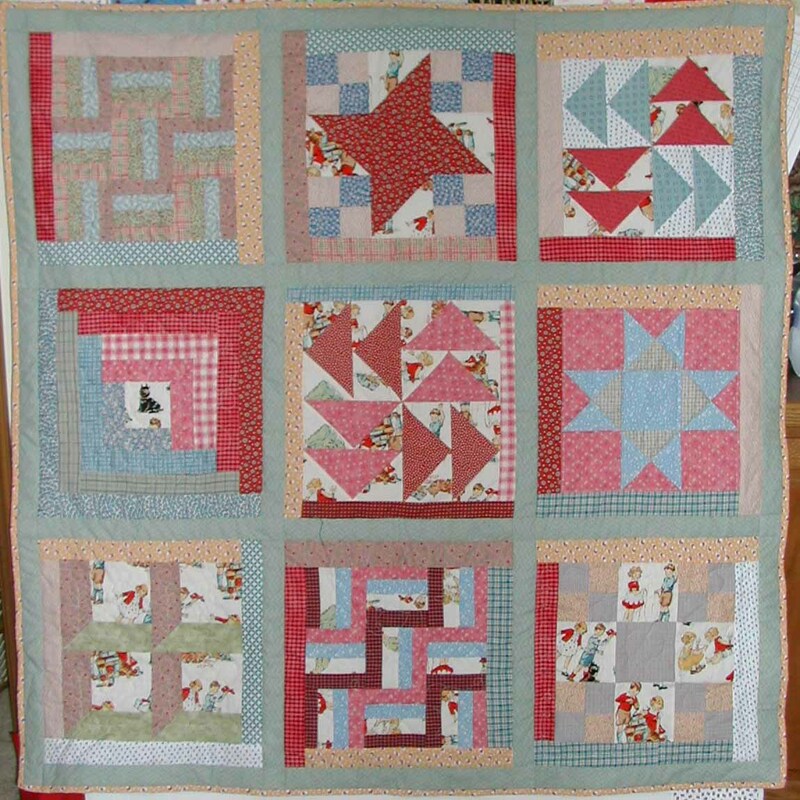 This quilt was pieced by Val at Block Party Quilters. 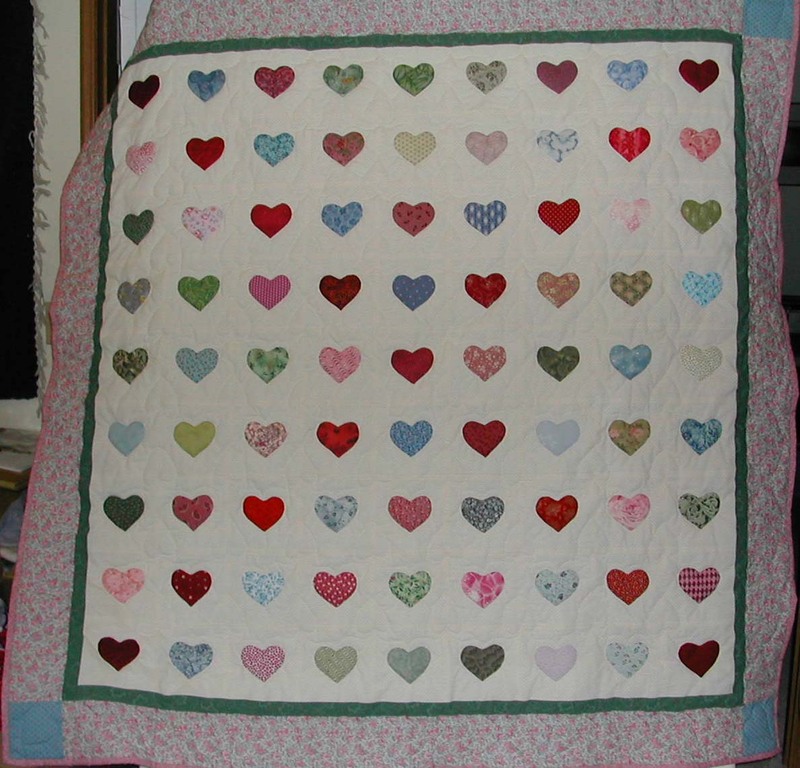 I was asked to quilt it - the hearts are all hand appliquéd on the quilt. Completed May 2003. 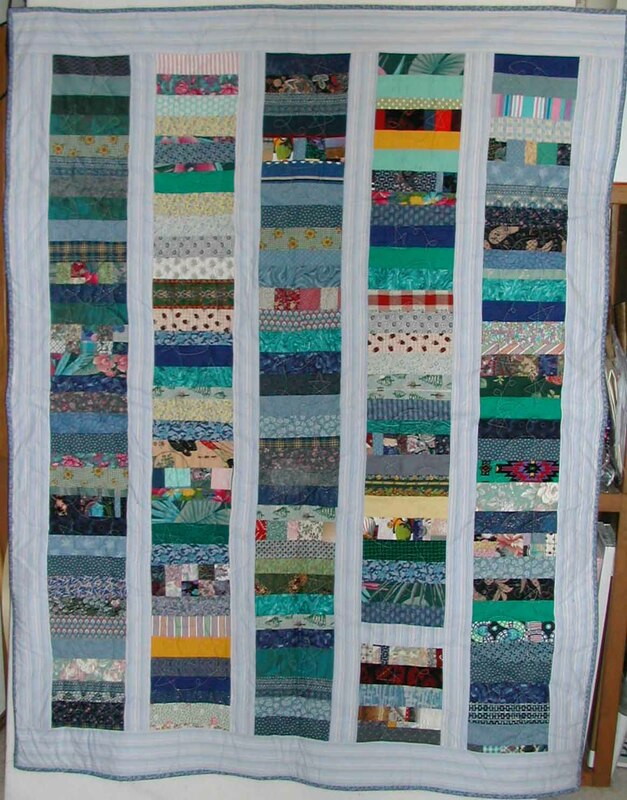 This quilt was pieced by someone in my Block Party Guild. 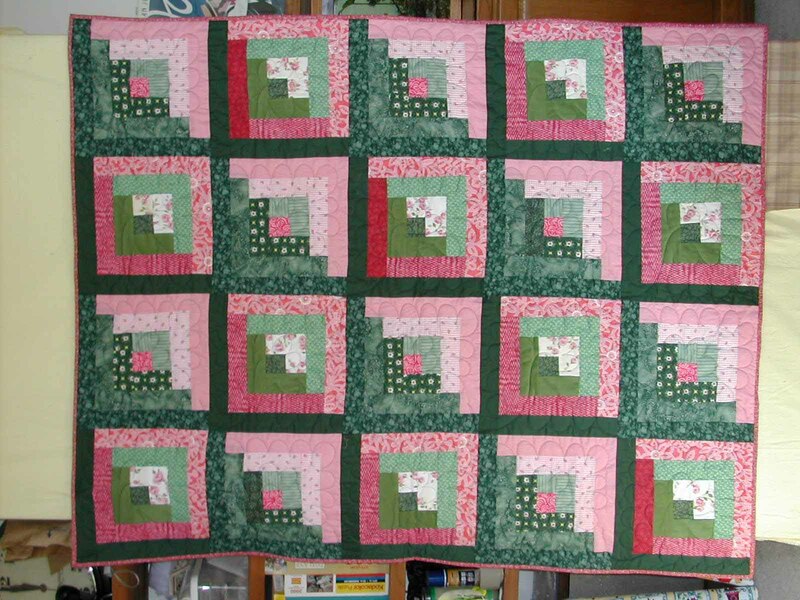 I was asked to quilt it. 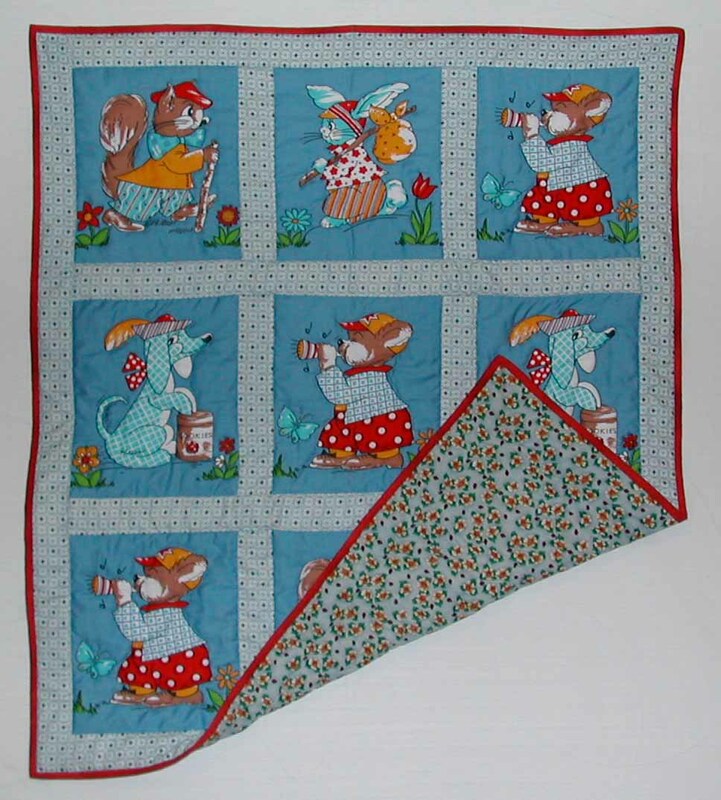 This quilt will be delivered to the Ronald McDonald House in Seattle. Completed March 2003. 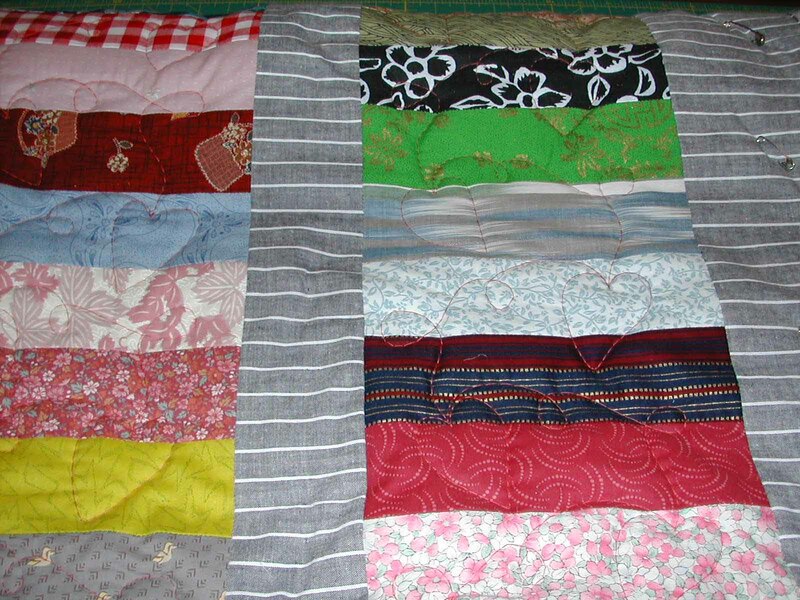 These ten Chinese Coin quilts were pieced by others in the group. 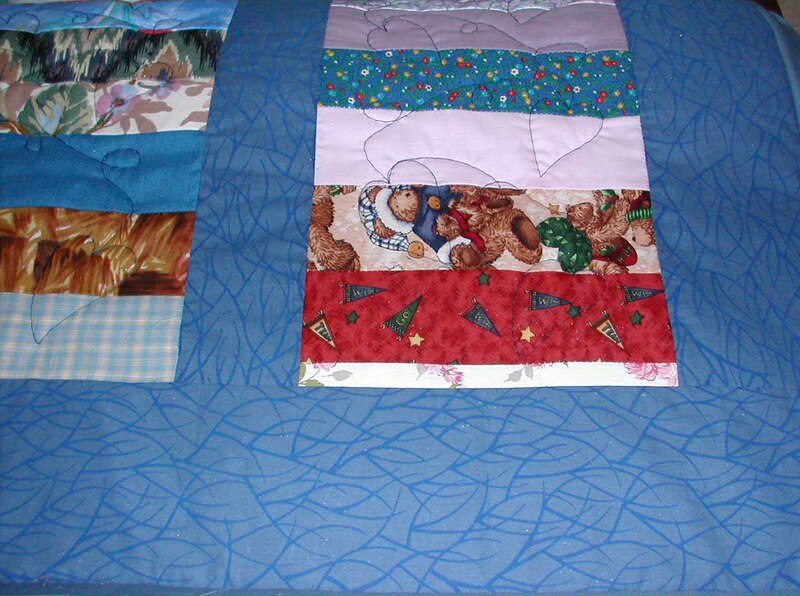 I receive them basted to the back then I quilt them and put the binding on. Finished March 2003. 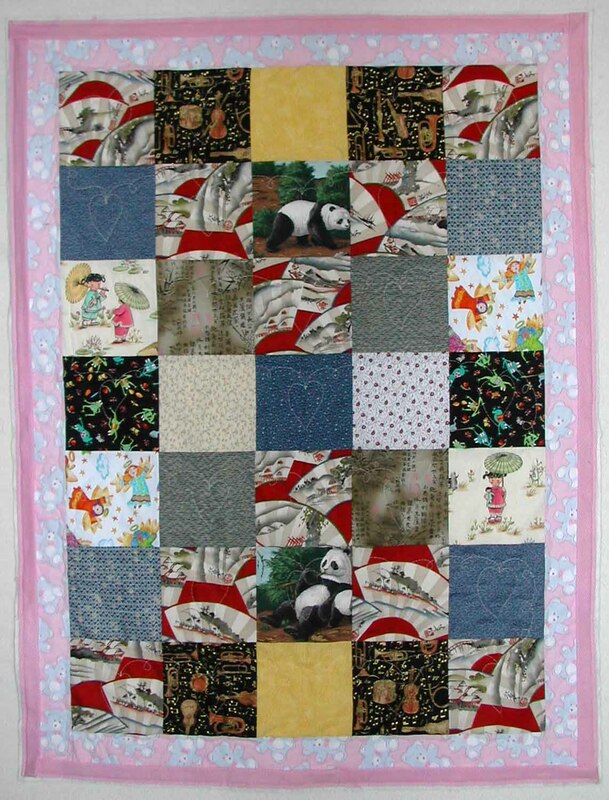 A friend of mine in North Carolina is waiting for her travel date to go to China to pick up her new daughter. In the waiting, she asked me if I could help in getting these four cuddle quilts made so that she can take them and give them to the orphanage. 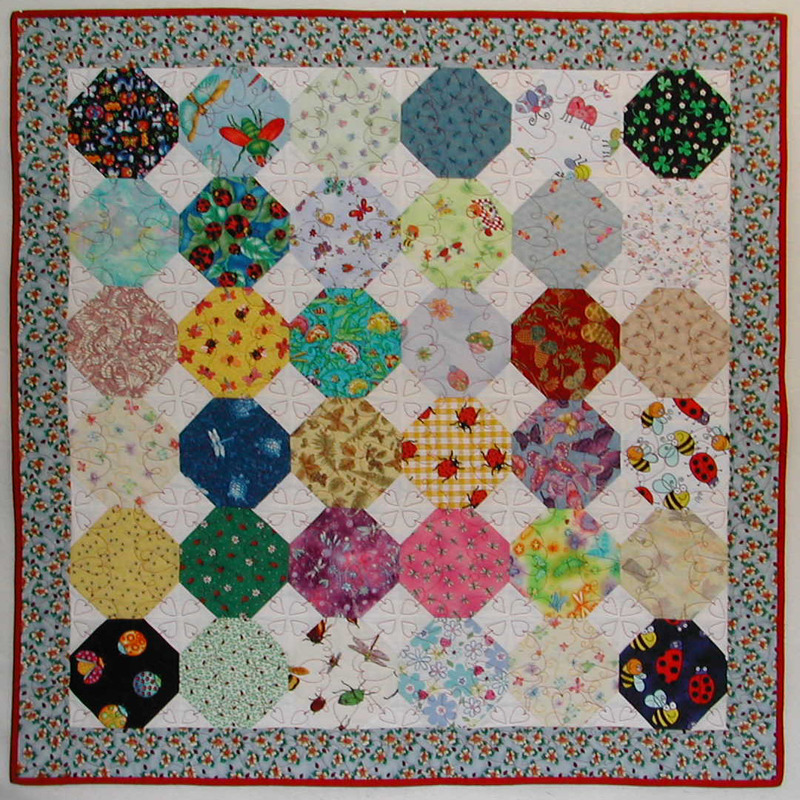 I have a friend who offered to do the piecing of the tops for this project, then I quilted them and attached the bindings. The final hand work on the bindings will be done by my friend prior to her trip to China. 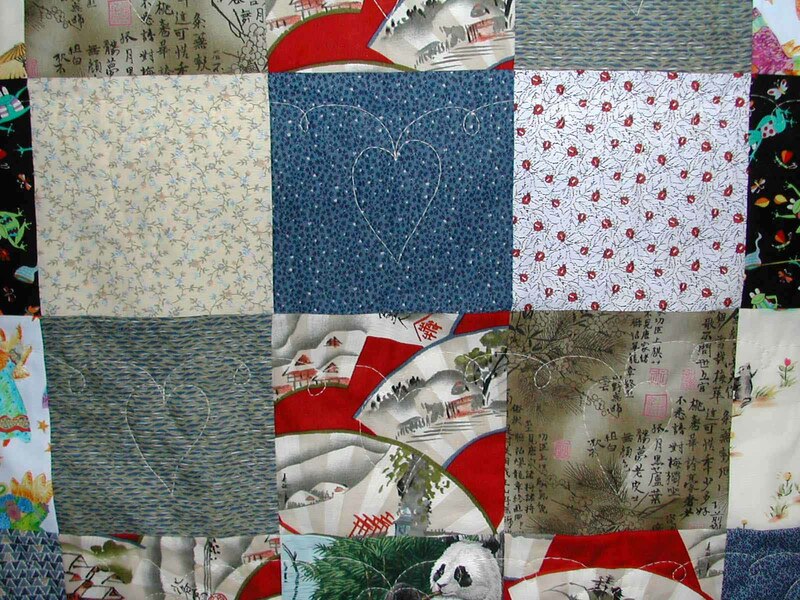 The four quilts are shown, and the last photo shows the detail of the hearts in the quilting. 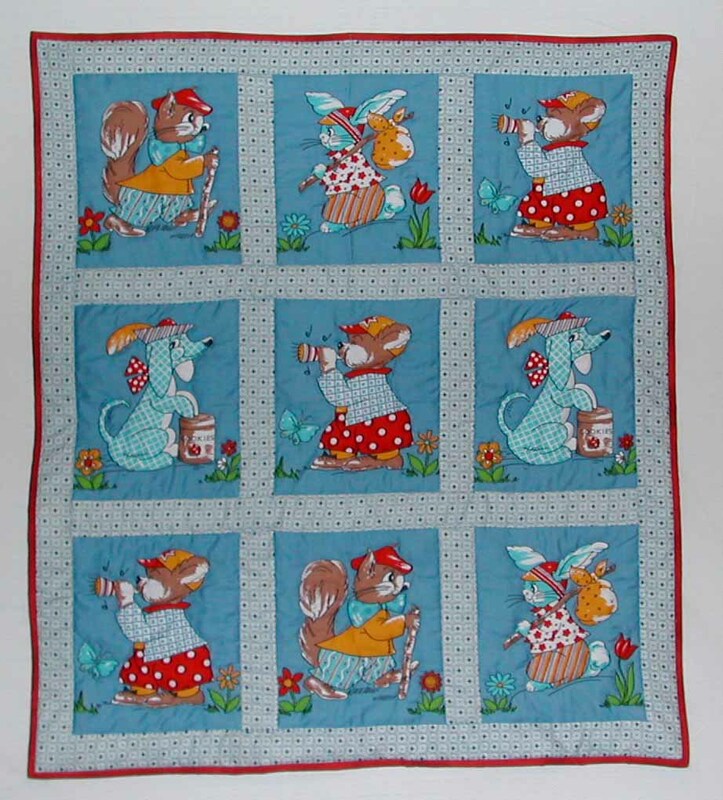 Many people come together to make the quilts for patients at Fred Hutch. 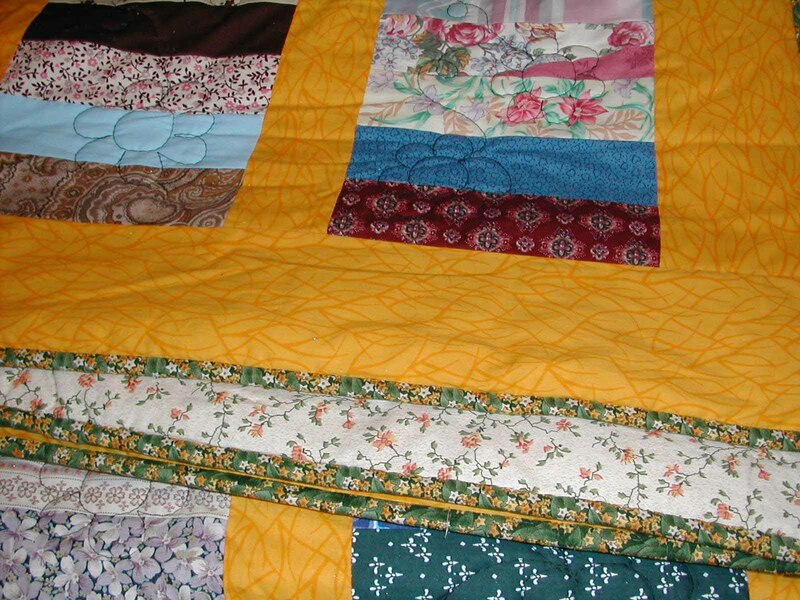 A group of women make up the quilt kits, some piece the tops, others quilt, and some finish bindings. 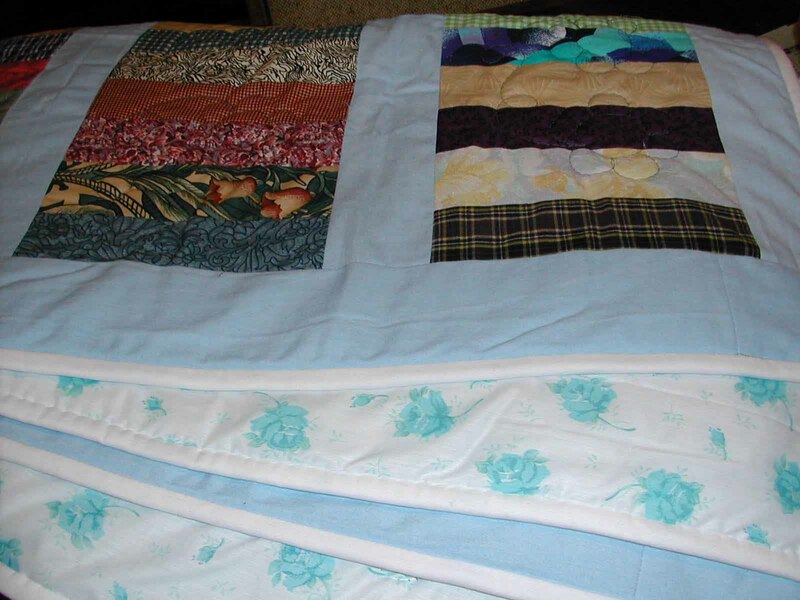 I quilted these four quilts, and finished the binding on them and delivered them back to Stone Soup Quilting in December 2002. 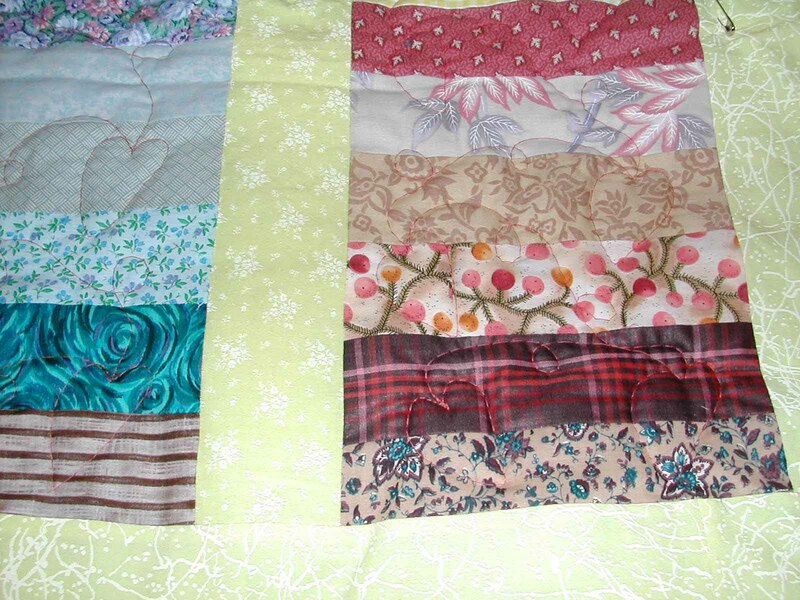 I added the bindings to these three quilts. These quilts go to Fred Hutchinson Cancer Center in Seattle to patients. 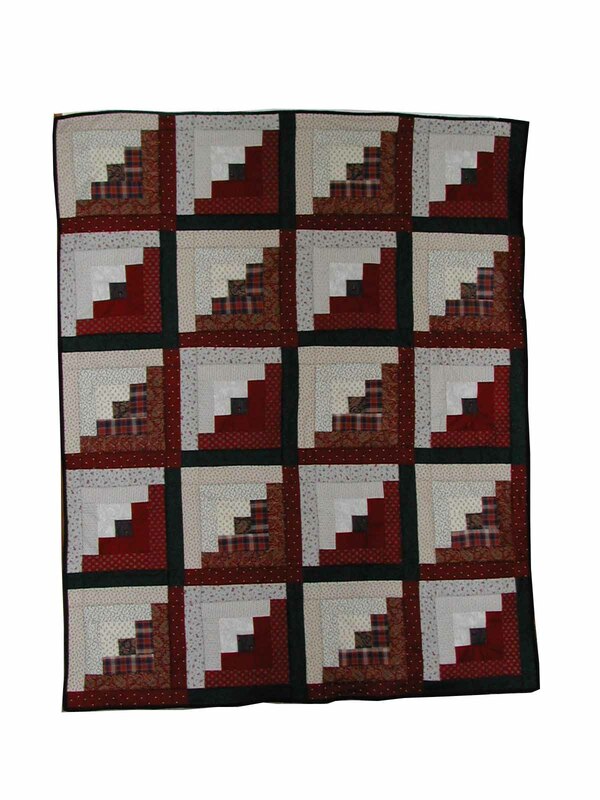 The blocks of this quilt were made by a client of mine. 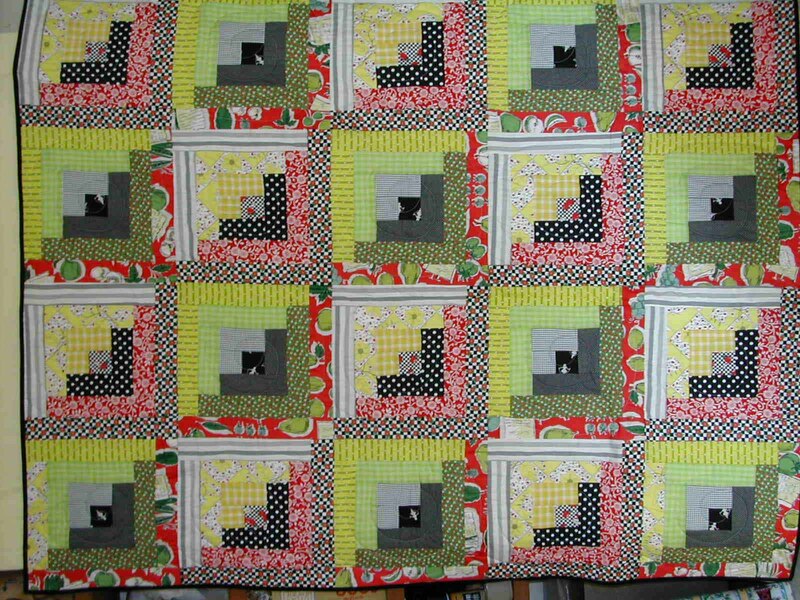 I added borders to the blocks to make them all the same size and added sashing between them. 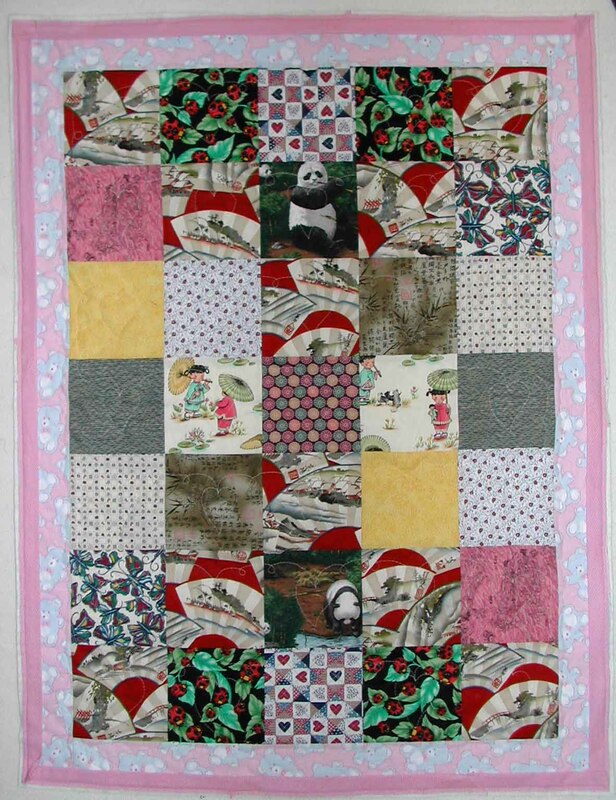 I gave this quilt to my friends Cindy & Richard to take with them to China to pick up their adoptive daughter. 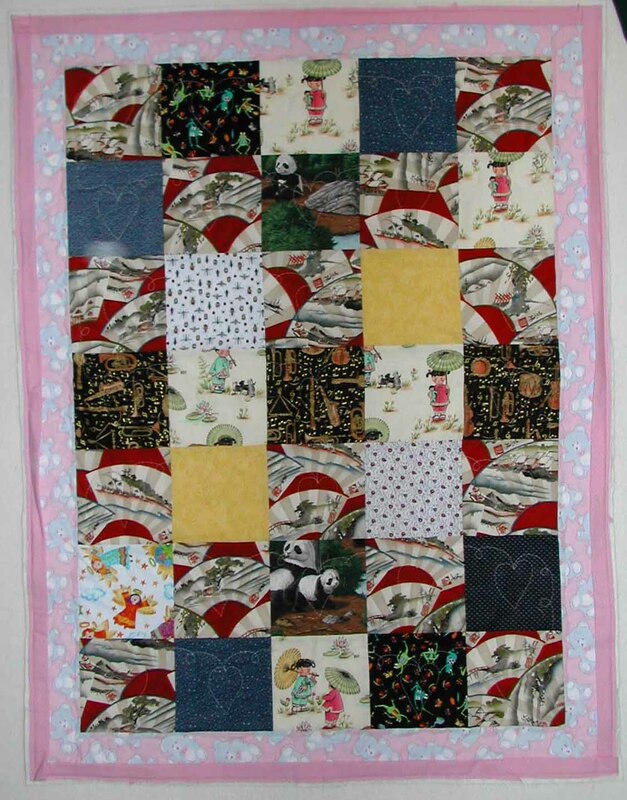 They gave this quilt to the people at the orphanage in China, so that a child in need of comfort can be wrapped in this warmth. 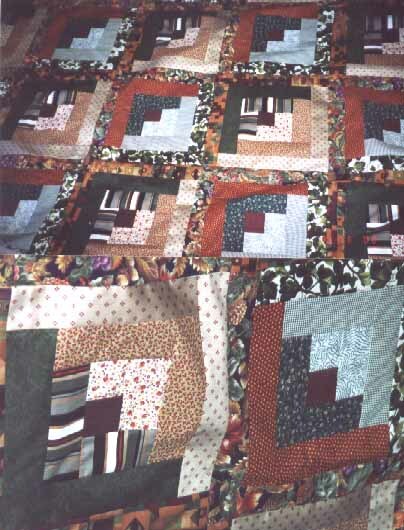 Each of the nine sampler blocks were machine quilted a bit different. Completed June 2002. 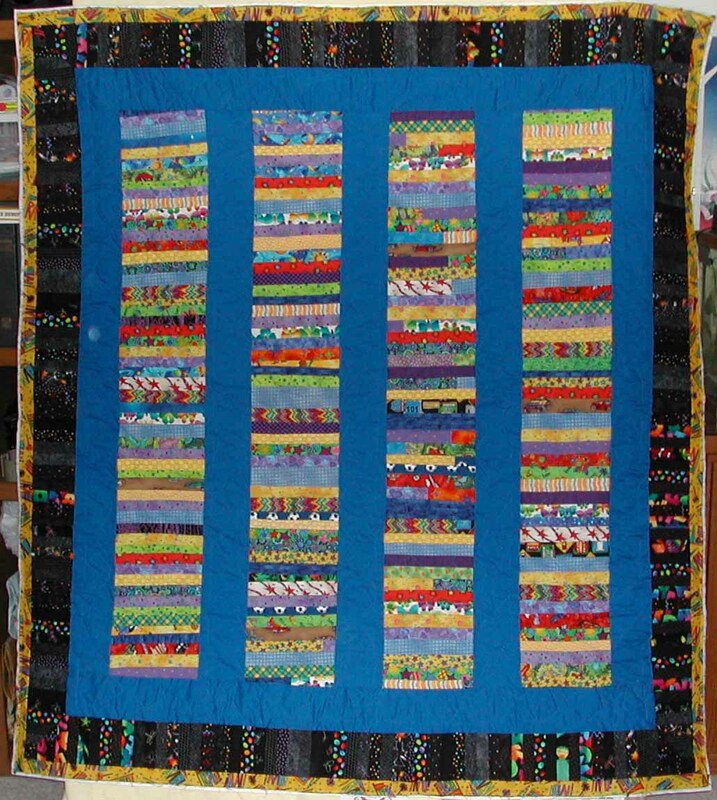 This quilt was made by a group of people at our church. It will be given away at annual conference. 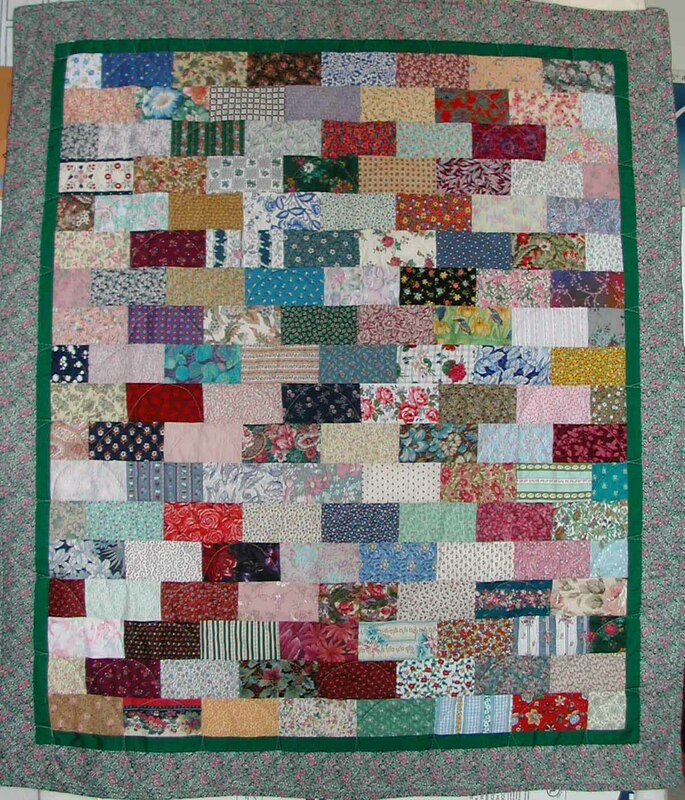 The quilt measures approx 68 x 64. 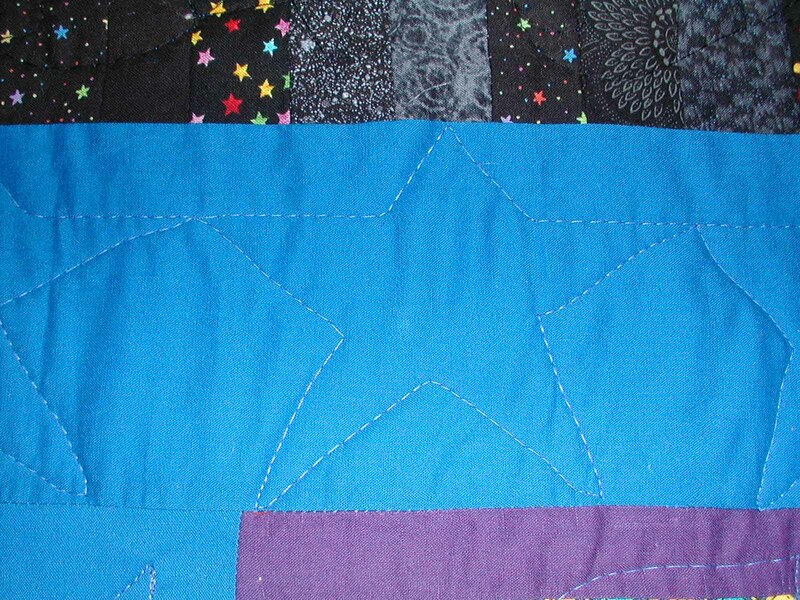 The top picture shows the entire quilt, the below photo shows a close up of the quilted stars. 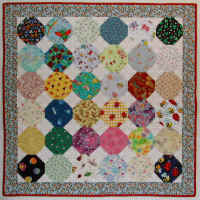 The quilting was all free motion stars quilted by Original Quilts. Completed May 2002. 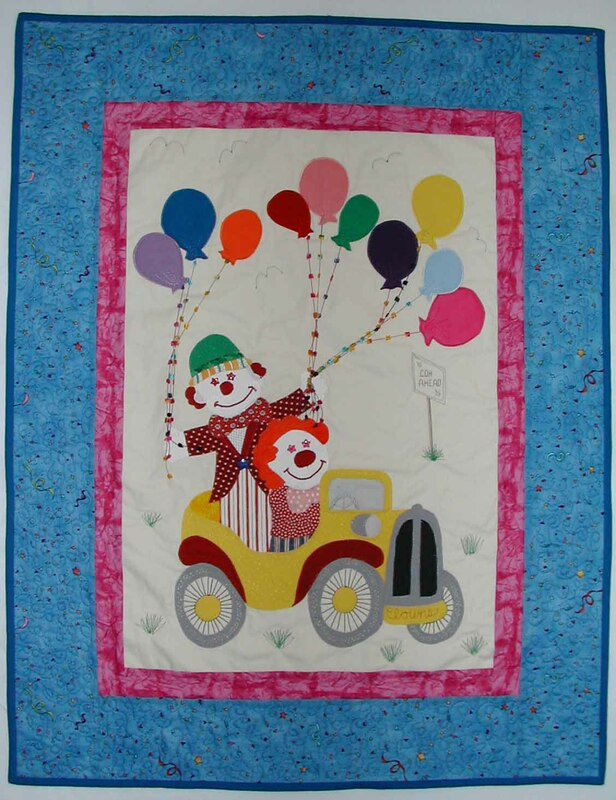 This quilt was made for an auction benefiting the Children's Orthopedic Hospital Clown Program in Seattle. 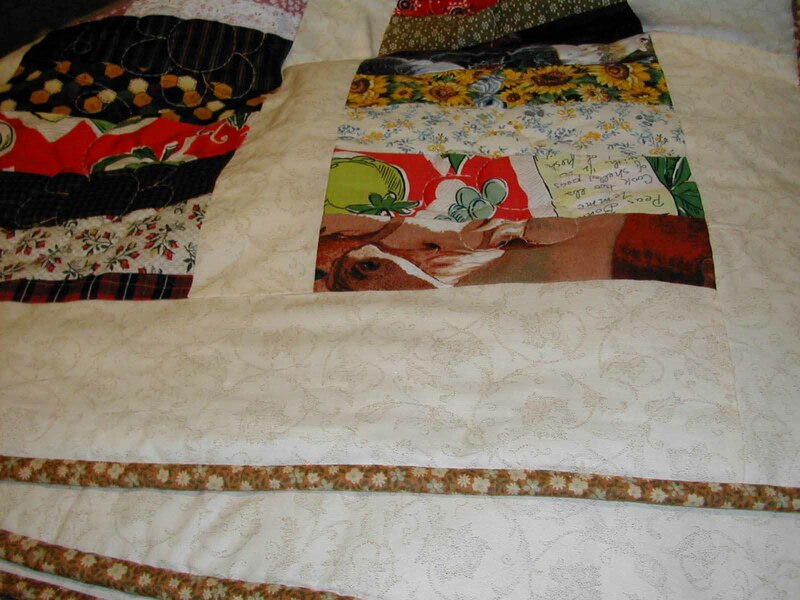 The quilt was auctioned off in May of 2002, and it raised $550 for Children's Hospital. 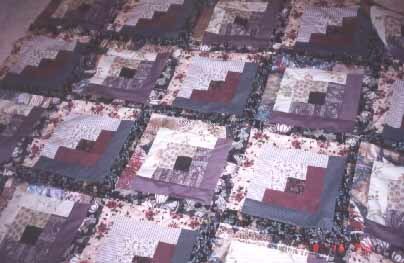 The quilt measures 32" x 40". 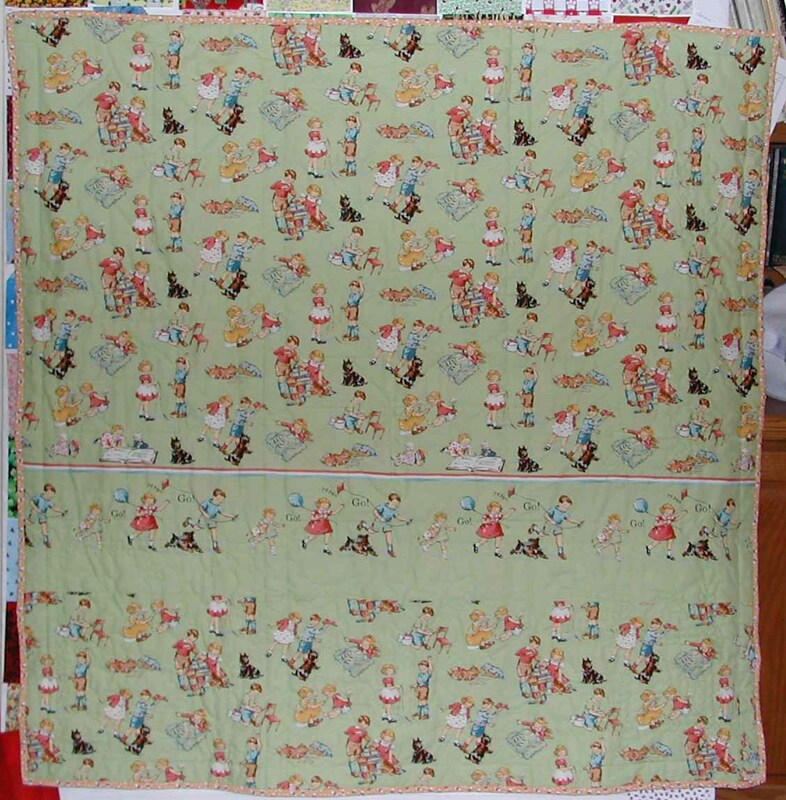 The clown pattern was donated by Elna Sewing Centre & Jan's Patch. Completed April 2002. 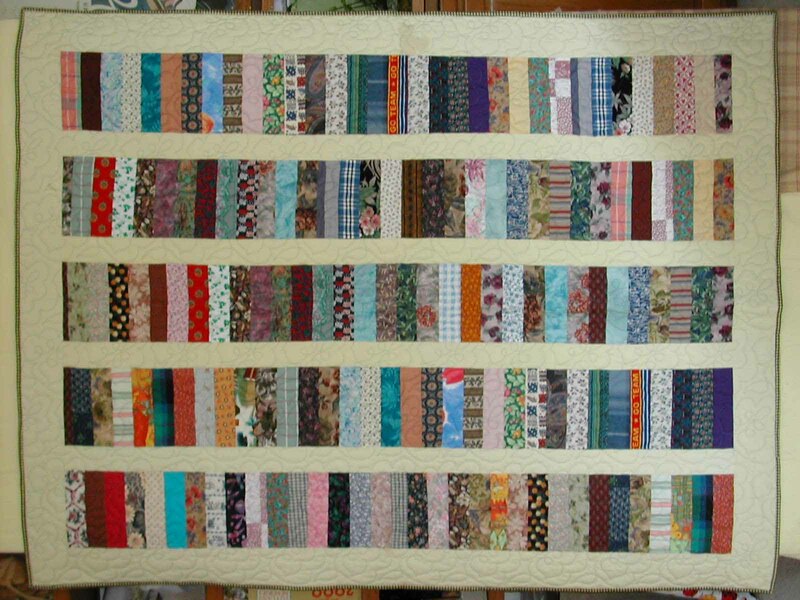 This charity quilt is made from donated fabric. 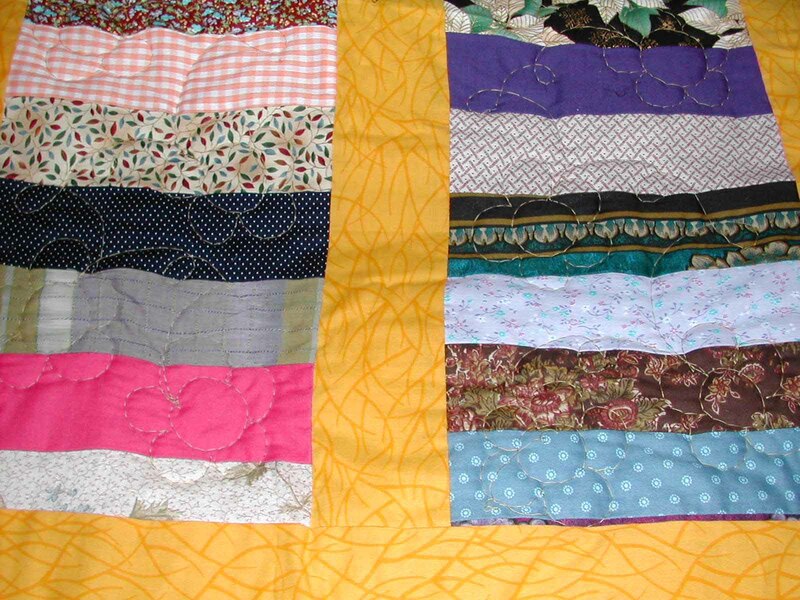 Customers of Original Quilts have the option of donating their unused (extra) fabric to Original Quilts for use in charity quilts. 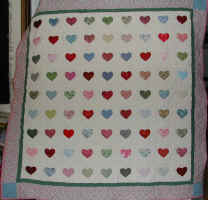 This quilt back is was donated generously from Sylvia (see Lydia's quilt). 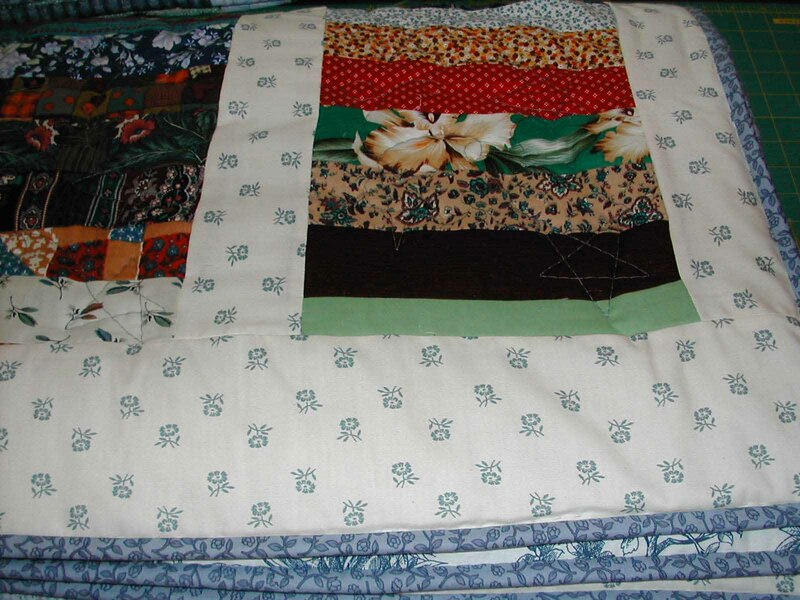 The fabric for the front of the quilt was donated from other sources. 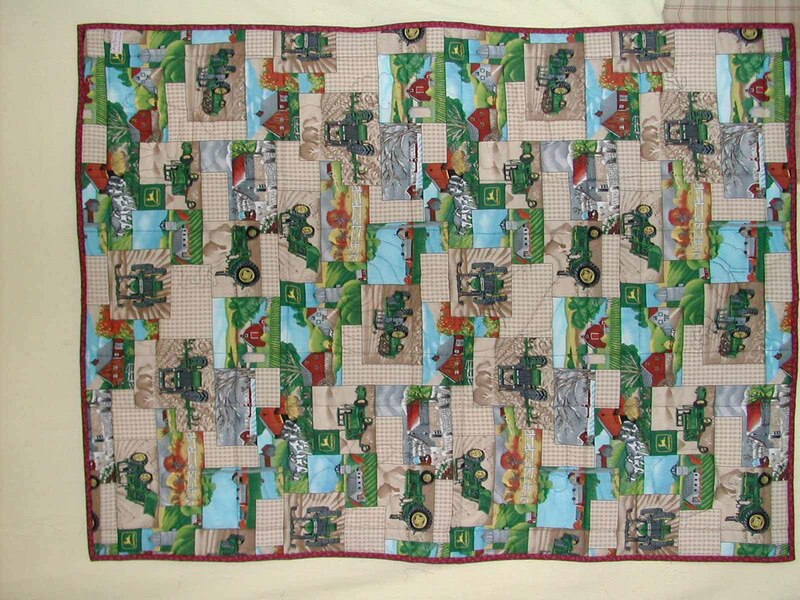 Ronald McDonald quilts are sewn by members of our quilt guild and donated to the Ronald McDonald house. Completed 12/01, another one just like this was completed January 2002. 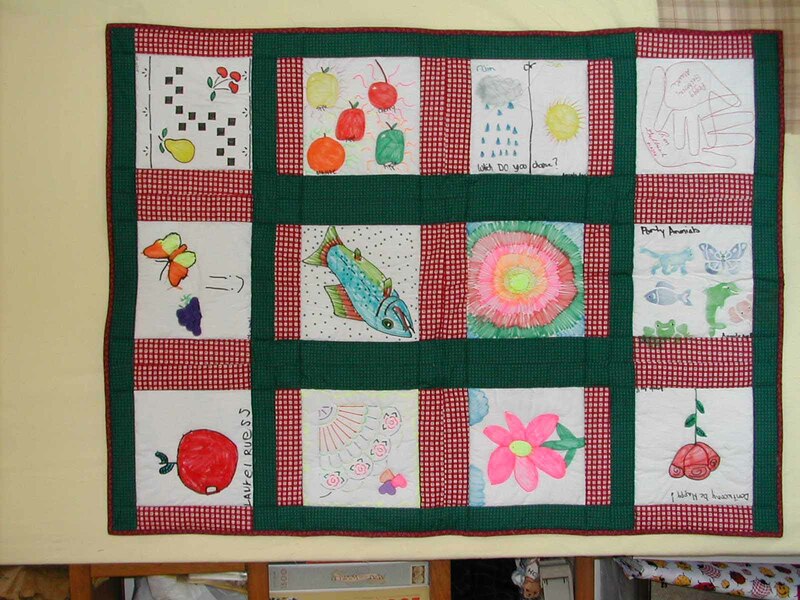 This is a quilt I worked on with other members of our church to give away at the annual conference. It was given to a child. 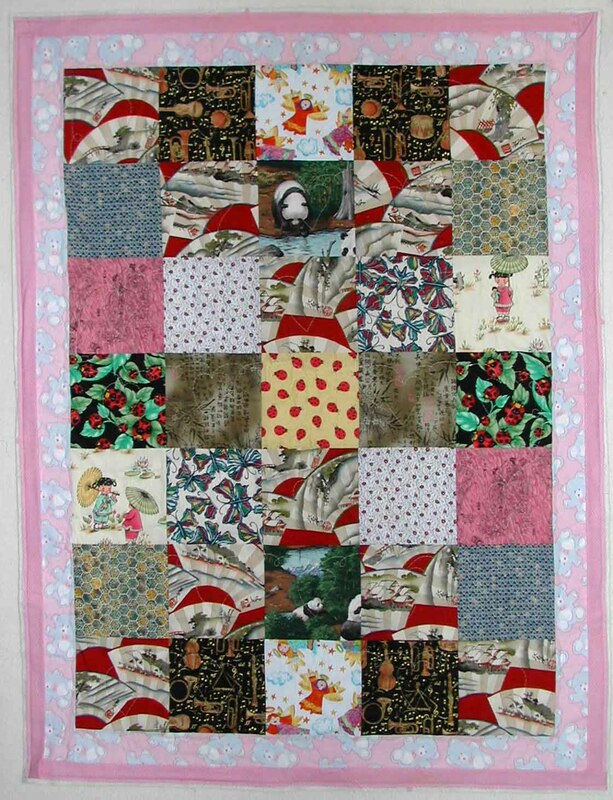 This is a quilt I sewed for Stone Soup which is a non-profit group in Seattle who sews quilts for patients at Fred Hutchinson Cancer Research Center. 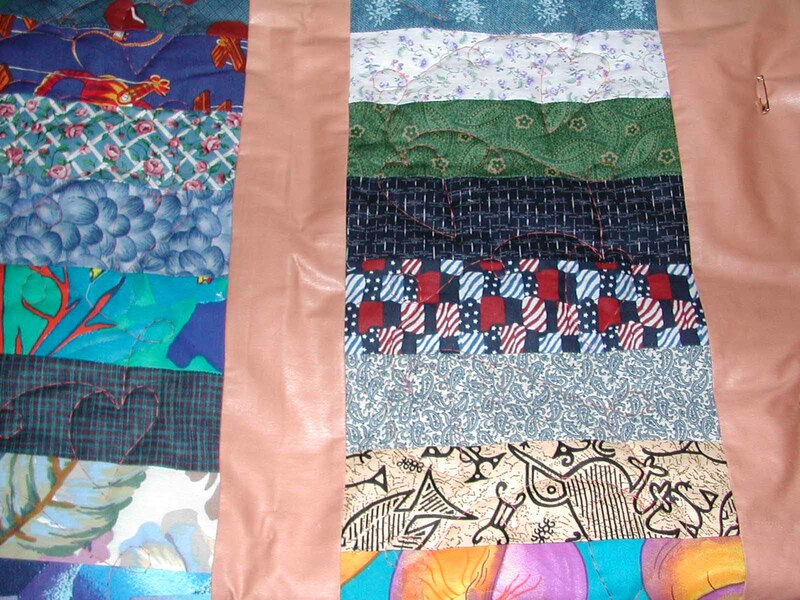 The fabrics are donated and matched together in kits, then given out for volunteer sewers to piece the tops. 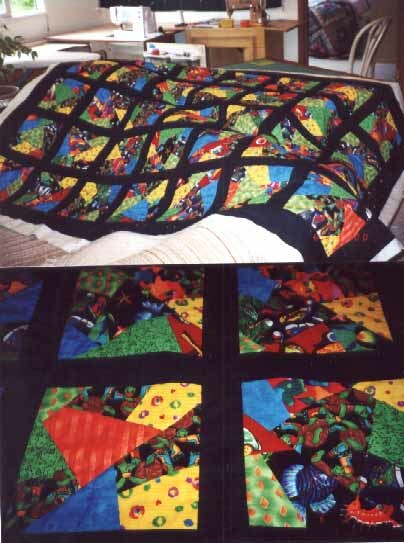 The top photo is of of the quilt, and the bottom photo shows more detail of two of the squares. This is a log cabin design. 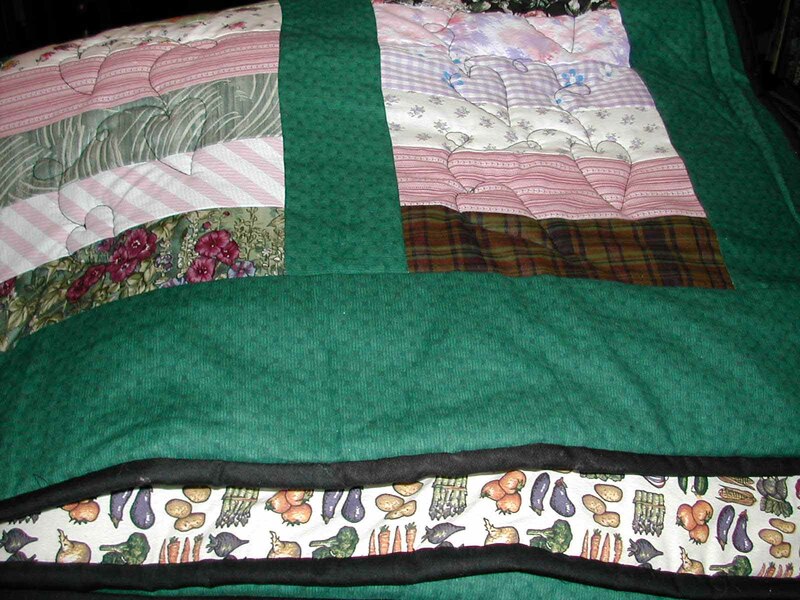 This is another quilt sewn for the Stone Soup - I pieced this one, but did not quilt or bind it.